Speaking to the “space-going “public at the Kennedy Space Center Visitor Complex at Cape Canaveral, FL, I find the energy level among visitors is already pretty high. 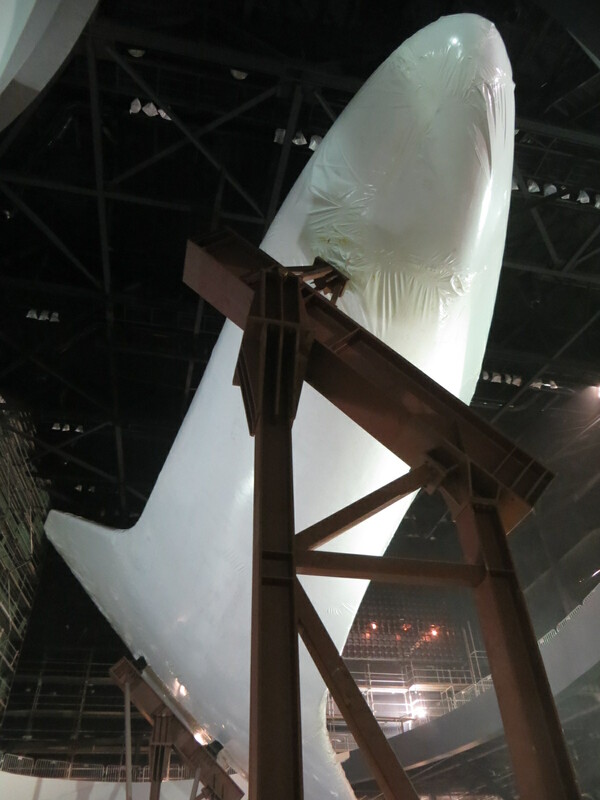 But it’s about to get a tremendous boost when the Space Shuttle Atlantis exhibit opens on June 29, 2013. 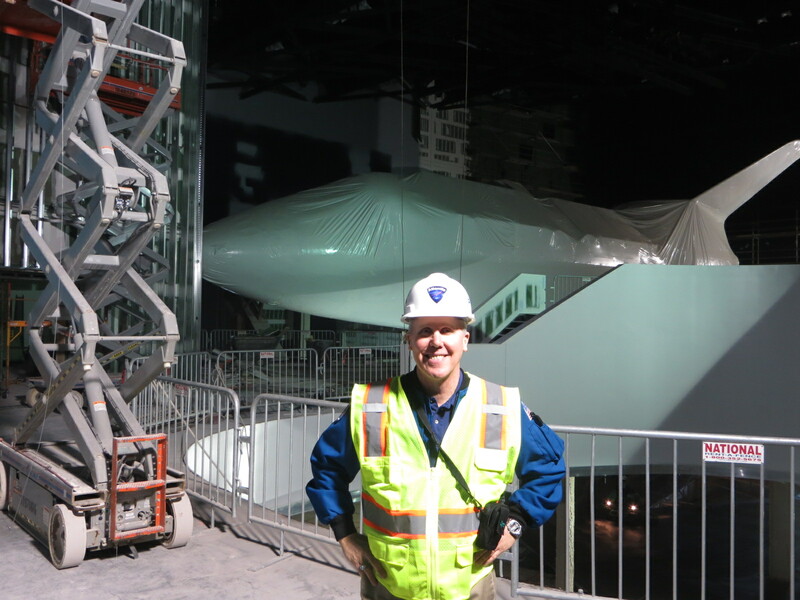 I visited the construction site this week and was amazed at the way Atlantis will be displayed to the public. 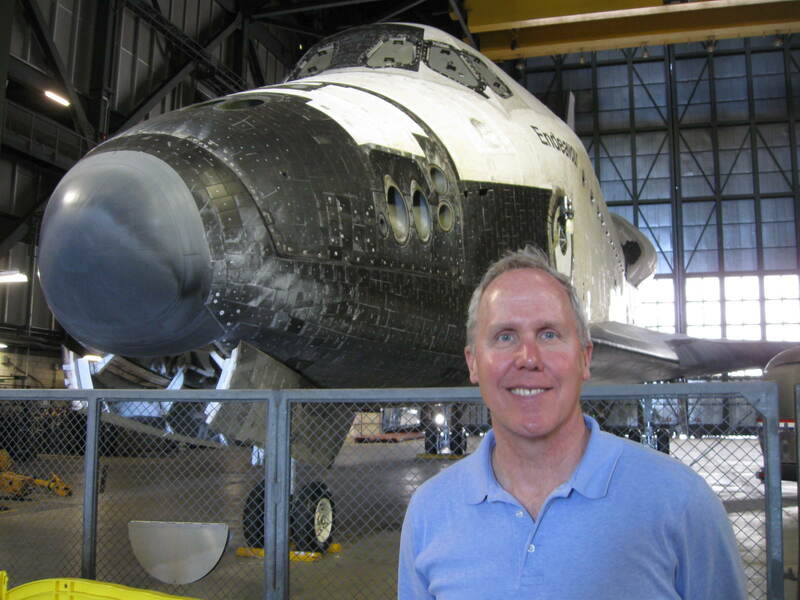 Atlantis was the last space shuttle orbiter I would fly, on STS-98, so even shrink-wrapped as she is, I am still moved when visiting the ship that took me to space, kept me alive to work at the International Space Station, and returned me safely to my family. Delaware North, the company that runs NASA’s visitor complex here, is spending about $85 million to give visitors an up close and personal look at the orbiter. She’ll almost be close enough to touch, and Atlantis is positioned in a steep left bank, giving guests a breath-taking sense of her impressive wingspan. Entering the building, guests will get a capsule history of the space shuttle’s history from its designers and astronauts, then a high-def introduction to Atlantis’ storied career, beginning with her first flight in 1985. Leaving the theater, visitors will walk “through the screen” to view the orbiter as she looked when in orbit. Close at hand will be a mockup of the Hubble Space Telescope. A wide ramp will enable visitors to spiral down and around the orbiter to see Atlantis, her cargo bay, windows and cabin, wings, engines, and heat shield tiles from every angle. Beneath the orbiter will be a roomy plaza, where guests will enter the Shuttle Launch Experience simulation. With blast-off under their belts, visitors will exit to a simulation bay where a future space traveler can try one’s own hand at flying and landing the space shuttle. You’ll have to drag me out of Atlantis’ presence–it’s going to be that good! Remember, before leaving Atlantis’ home, pick up a copy of my story detailing my Atlantis mission to the ISS on STS-98, and my three other missions: Sky Walking: An Astronaut’s Memoir. Astronaut as Explorer: Jack Schmitt on Apollo 17, December 1972. Duane Ross ran the selection process when I was lucky enough to be hired in 1990. He’s still at it. He and Teresa Gomez were our guides through the process and welcomed my colleagues once we were selected and planning our moves to Houston. Here is his take on the latest round of astronaut selections: Popular Science Q&A: How NASA Selected The 2013 Class Of Astronauts. Good luck to the new candidates (when announced) and to future applicants and colleagues! Consult NASA’s astronaut selection and training site to learn the basic requirements and procedures. But — you’ve already done that. Participate in some outdoor, physical, active hobby or pursuit that complements your day job and shows aptitude for skills needed in spaceflight. If you’re having fun, you’ve chosen a good activity! Keep getting better at it. Increase your chances of passing the NASA physical by following a regular exercise and fitness program. Get to your ideal weight – it makes a good impression and avoids health problems later. Become conversant about one specific aspect of the NASA human spaceflight program — present or planned — and be able to discuss it comfortably with the selection panel. You should know what you’re getting into. Be meticulous about your application. Typos and grammatical errors were an instant turn-off for me when I was at NASA. Showcase your professional skills in writing and communication. Tell NASA in your application what you will bring to their team. How will you help advance specific NASA goals? Ask questions on your visits to the Astronaut Office. Poke your head in the office doors and ask crewmembers what they are working on, and what they like and dislike about the job. In the interview, be yourself. Keep your answers brief and specific, but don’t be afraid to speak plainly and sincerely. The panelists want to get a sense of who you are – and if they would like to work with you. Let your natural enthusiasm for space shine. Be professional yet enthusiastic. I was eager to get the chance to interview, and let the panelists know it. Take the long view. If not selected, you can apply again. Resolve to go back to your present job and to improve your qualifications for the next round. Network with your fellow applicants, online, and in Houston. Perhaps someone chosen can help you with advice for the next opportunity. And you might make a life-long friend. I believe NASA will keep hiring small numbers of astronauts to keep their work force adaptable and energized. See the report of the NRC panel on the future of astronaut training that I helped prepare in 2010. And remember that the commercial spaceflight sector, as it grows, will also need talented crewmembers. There are broader opportunities today than ever before in space, although the numbers of people flying to orbit annually will remain at less than a dozen, at least for another five to ten years. Good luck! Say hello to my friends on the selection panel. And send me a note from space! On my week-long speaking tour at Kennedy Space Center Visitor Complex, I drove out with communicators Nick Thomas and Mark Smith to visit my first shuttle, orbiter OV-105, Endeavour. Today she was being readied for her final voyage to the West Coast and future home at the California Science Center. Hoisted atop the NASA 747 carrier aircraft, Endeavour was the center of attention as the skilled shuttle techs fastened the orbiter to her three attach points on the shuttle carrier. On Monday she’ll take flight enroute to Houston, El Paso, Edwards Air Force Base/Dryden Flight Research Facility, and finally, LAX. 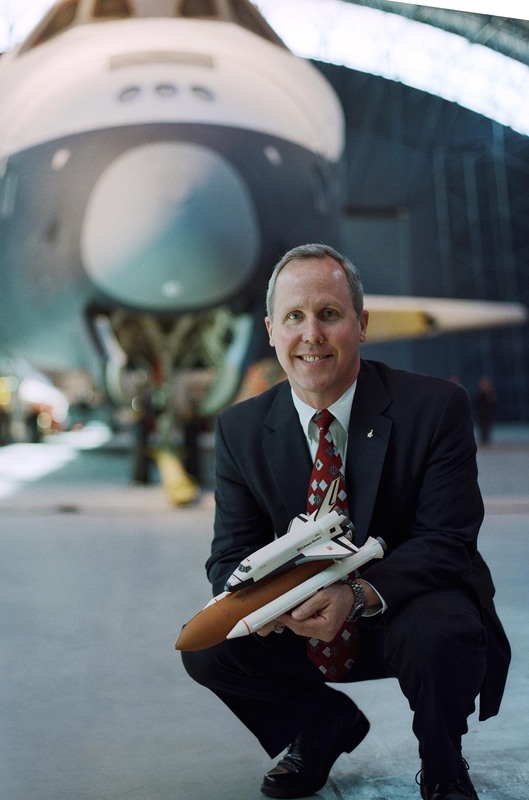 Astronaut Tom Jones with OV-105 Endeavour, 14 Sep 12. I will miss Endeavour’s regular presence in space. May we Americans soon send her successors into space to fulfill her legacy. 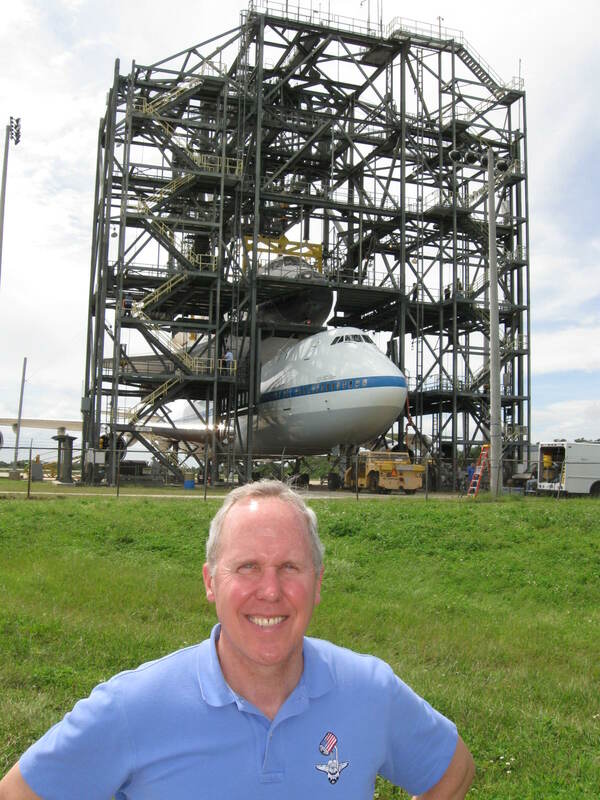 I’m speaking here this week at Astronaut Encounter at the Kennedy Space Center Visitor Complex, meeting people from all over the planet, I’m energized by the enthusiasm and thirst for new discoveries in space shown by our visitors. The spirit of space exploration, pioneered by Mercury, Gemini, Apollo, Skylab, the Space Shuttle, and now the International Space Station, is captured here at the Visitor Complex. Here we come face to face with the history and hardware of the last fifty years of our work on the space frontier. I’m like a kid in a candy store. 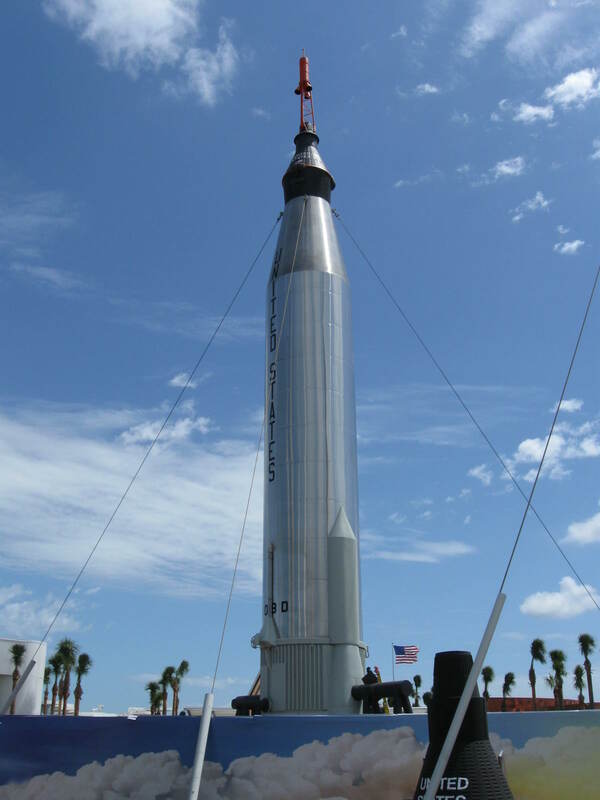 The Mercury-Atlas rocket and capsule, a replica of the booster that sent John Glenn around the world on America’s first orbital flight, was just erected here at the Visitor Complex. The Mercury-Atlas joins the Gemini-Titan II, an actual space booster, towering over the smaller vehicles in the Rocket Garden. The Gemini Titan II was assembled and tested in Middle River, MD, about two miles from my boyhood home. 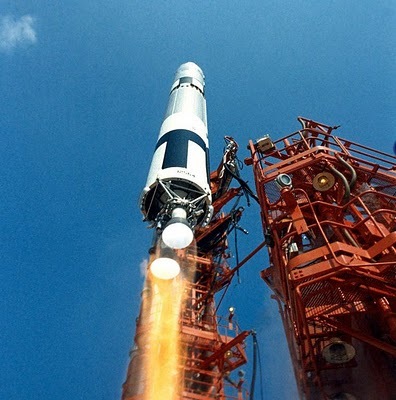 As a 10-year-old boy, I visited Gemini Titans for Geminis 7 and 8, and secretly promised myself I would one day ride a rocket. The biggest booster in the Rocket Garden is the Saturn IB that stood by as the rescue launcher for our Skylab space station crews. Space shuttle Endeavour—my first ship–leaves here Monday for its final voyage to the West Coast, and Atlantis will move to the Visitor Complex this fall, to its permanent home welcoming returning astronauts and all those who love the story of spaceflight. Just a few miles north is the Apollo-Saturn V moon rocket, on spectacular display overlooking Banana Creek and Launch Complex 39 pads that sent Americans to the Moon (and me aloft on my four space shuttle flights). I’ve been lucky enough to meet many of the Apollo astronauts, and had the pleasure of working with several at NASA’s astronaut office, on the NASA Advisory Council, and in the educational efforts of the Astronaut Scholarship Foundation. 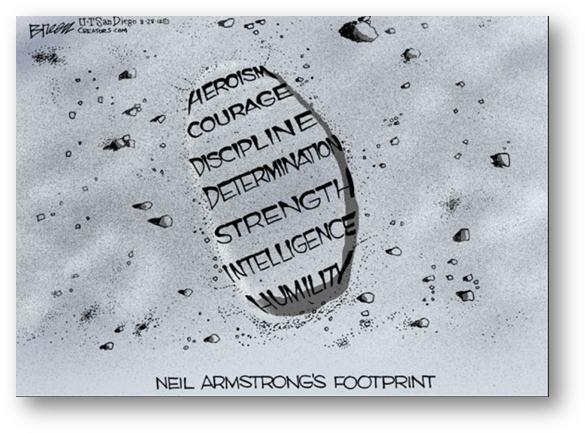 One of those exemplary figures was Neil Armstrong, whom we lost last month when he passed away at age 82. Neil, the first human to walk on the Moon, will be memorialized tomorrow at the National Cathedral. He was a skilled aviator, test pilot, and engineer, a committed explorer, an able spokesman on the importance of exploration to the nation, and a role model for an entire generation of astronauts. I most appreciated his modesty and dignity as he dealt with the celebrity that history thrust upon him. Neil made his fame serve a higher purpose. We honor his service and courage, and we will miss him. Here at Kennedy Space Center, NASA and its partners are creating our future in space in the form of the machines that will carry our footsteps alongside Neil and his colleagues, then beyond to the nearby asteroids and Mars. Even more important, though, are leaders who will commit us to challenging goals on the space frontier, follow through with the resources needed to succeed, and inspire our young explorers to fulfill that dream. Tom Jones is a veteran astronaut, planetary scientist, and author of Sky Walking: An Astronaut’s Memoir: www.AstronautTomJones.com. The B612 Foundation announced last week that it will raise funds to launch and operate a space-based telescope to search for dangerous near-Earth asteroids (NEAs). The hazard from these bodies is real. The Tunguska impact in Siberia, in 1908, was caused by Earth’s collision with a small asteroid, about 40 meters across, which exploded with the force of 3 to 5 Megatons of TNT, enough to level a major city. 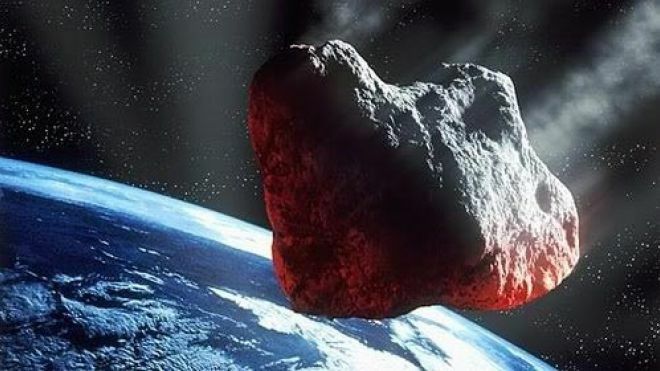 There are about a million near-Earth asteroids big enough to penetrate Earth’s atmosphere and cause city-wide or regional destruction; Tunguska-sized impacts occur every few centuries. Each year, about thirty explosions as powerful as the Hiroshima A-bomb occur in the high atmosphere from small asteroid impacts. Today, we know of less than 10,000 of these objects. The number of detections is growing rapidly, thanks to NASA’s search program. The agency spends $20M per year on asteroid detection and research. One good result is that NASA-funded Earth-based telescopes have discovered about 90% of all NEAs > 1 km (about 5/8 mile) in diameter. These objects could cause global damage if they struck Earth. Fortunately, none is on a collision course in the next century (see the most worrisome impact threats here). In fact, today we know of know of no asteroids with a high probability of impact. There’s the rub: We have detected and have orbits for less than 1% of the asteroids capable of causing extensive damage on Earth. We need a much more thorough search. At the current pace of NASA funding, we will not find these numerous small asteroids for decades. To fill this detection gap, the private B612 private foundation (full disclosure: several friends are involved in running B612) wants to launch Sentinel, a sun-circling space telescope to find these dangerous asteroids. Two astronaut colleagues are principals in the B612 effort: Rusty Schweickart (Apollo 9) and Ed Lu (shuttle, Station). Sentinel will be privately funded, and once launched, will deliver NEA detection results to NASA, and through the Minor Planet Center, to other space agencies and scientists. Sentinel has a main mirror about half a meter wide, and stands about eight meters tall. The relatively simple spacecraft is based on the Kepler planet-hunting telescope and the detectors are based on those of the WISE infrared telescope. The mission will cost about $500M over a decade, about the same as a typical Mars orbiter or Discovery-class interplanetary mission. Our ground-based asteroid observatories search only at night, and can’t look too close to the Sun, missing those NEAs which spend much of their time in Earth’s daytime sky. To overcome those limitations, Sentinel will orbit the Sun in an orbit similar to that of Venus, about 0.7 the distance of Sun to the Earth. Racing on the inside track interior to Earth’s orbit, Sentinel will discover NEAs more efficiently than ground-based telescopes: it will sweep through the asteroid swarm more rapidly than Earth, and looking outward past Earth, it will see small asteroids inside Earth’s orbit, those usually invisible to terrestrial telescopes. Sentinel will detect heat, or radiation in the infrared portion of the spectrum, where asteroids shine brightest. It will ignore background stars and look for rapidly moving objects—NEAs. The telescope will relay the orbits of asteroids it detects to the Minor Planet Center catalog. NASA will then run an analysis of these thousands of new orbits to look for possible future impacts. If funds are available, Sentinel can launch in about five years. Once in its Venus-like orbit, the mission will take about 5.5 years to detect and map most of the small asteroids bigger than 50 m across. NASA itself has studied NEA search missions like Sentinel, but in its current budget straits the agency says it cannot afford it now. The White House has chosen not to budget for such a telescope and its “asteroid insurance” policy, waiting for Congress to appropriate the funds. For its part, Congress in 2005 directed NASA to find 90% of the NEAs that are larger than 140 m, representing most of the remaining impact risk to Earth. But it has failed to deliver explicit funding for the telescope mission. That’s where Sentinel comes in. The Sentinel project or one like it is the fastest way for us to reveal the cosmic shooting gallery within which Earth orbits. B612 has decided not to wait for NASA, and to start the discovery process now. Astronaut colleague Rusty Schweickart says that right now, we are driving around the solar system without insurance. The B612 team plans to fly Sentinel, and work with NASA along the way to get this vital NEA tracking information to society. An important side benefit is that Sentinel will also tell NASA which asteroids are in the best, most accessible orbits for future astronaut expeditions to the nearby NEAs. Endeavour’s STS-59 crew took this look, on April 18, 1994, at the north and south Forks of the Shenandoah River. North is to the left. 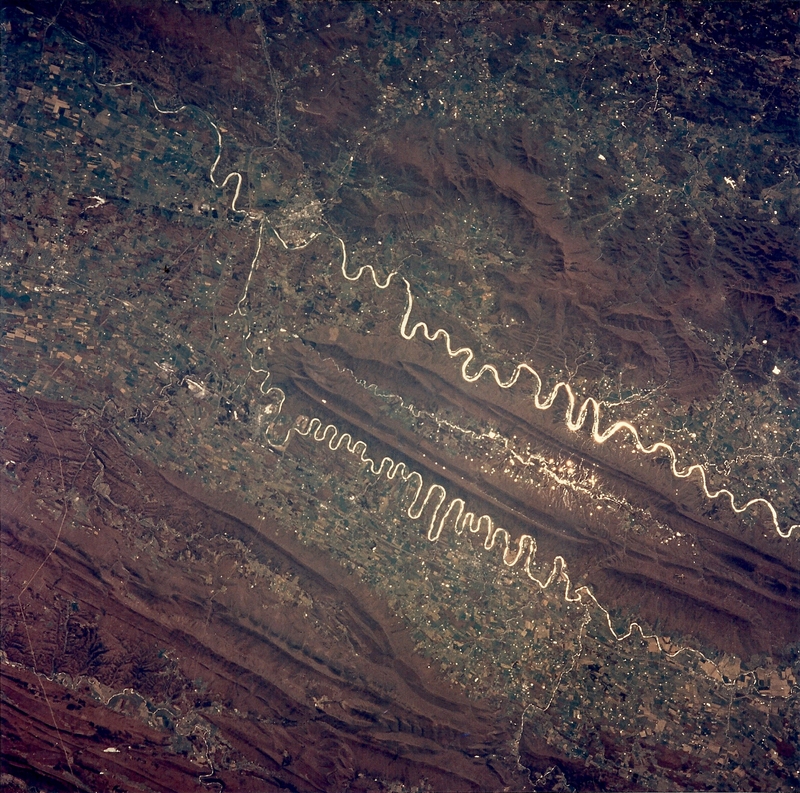 Seen in sunglint, the South Fork (top) and the North Fork (bottom) of the Shenandoah meet at upper left; Front Royal, Virginia is just above the combined rivers at the junction. Massanutten Mountain, covered by reddish-brown fallen leaves of the George Washington National Forest, separates the river forks in springtime view. Skyline Drive and the Appalachian Trail run along the Blue Ridge from upper left to mid-scene right, NE to SW. Passage Creek flows toward upper left in the interior, Fort Valley of Massanutten, finally reaching the Shenandoah’s north fork.I-66 enters this view from the top left center, from Washington. At center left are the scars of two limestone quarries, which have now grown larger and threaten the Cedar Creek Civil War battlefield just left of the junction between I-66 and I-81. The Alleghenies form the mountain barrier to the west (bottom). Signal Knob is the promontory at the left (north) end of Massanutten; it was a critical Confederate observation point prior to the Cedar Creek battle in October 1864. Across this scene, Stonewall Jackson played out his masterful Valley Campaign in spring 1862. Employing audacity and rapid, unpredictable movements on interior lines, Jackson’s 17,000 men marched 646 miles (1,040 km) in 48 days and won several minor battles as they successfully engaged three Union armies (52,000 men), preventing them from reinforcing the Union offensive against Richmond. Whenever one looks out the cabin window, the sweep of history and Earth’s natural beauty can nearly overwhelm an astronaut. But our work on Space Radar Lab 1 pulled us reluctantly away. Hope this view will inspire you to make time for a hike on the AT or up Massanutten. Tomorrow morning at 4:55 am EDT (May 19), SpaceX will attempt to launch its Falcon 9 booster, carrying the Dragon cargo capsule, to the ISS. SpaceX built the Falcon 9 and Dragon as part of NASA’s commercial orbital transportation services (COTS) program, combining private and NASA/taxpayer funds to supply the Station after shuttle retirement. SpaceX has received about $400 million for the test launches, and has a contract worth $1.6 billion for 12 cargo shipments to the ISS. Founded in 2002, Elon Musk’s company has flown its Falcon 9 to orbit twice, and its Dragon capsule once. On that Dec. 2010 orbital mission, Dragon became the first private spacecraft in history launched to and recovered from orbit. — Be grappled by the ISS crew and berthed to the Earth-facing (nadir) hatch in the Harmony module (Node 2) at the forward end of the ISS. 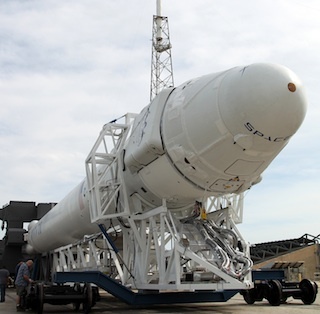 If all goes well, on Tuesday, May 22 (Flight Day 4), the SpaceX team will attempt its close approach to the Station, followed by grapple operations and berthing. Dragon will stay at the ISS for about nine days, deliver its cargo, be loaded with trash and returning science hardware, and then be unberthed for departure. Following a retro-rocket burn, Dragon will re-enter the atmosphere, deploy parachutes, and splash down off the California coast for recovery. SpaceX’s launch is the first cargo delivery to the ISS under NASA’s commercial services contract. NASA needs SpaceX and its other commercial partner, Orbital Sciences (whose first test launch may come in August) to succeed. NASA will rely on these companies in order to deliver cargo once launched by the space shuttle. Cargo launches by Russia, Europe, and Japan cannot make up the demand if these private companies do not succeed. So overall commercial launch success is vital to NASA’s attempt to lower costs, escape the Russian cargo monopoly, and fill ISS cargo demands after shuttle retirement (some 40 metric tons through 2015). SpaceX is nearly 3 years behind schedule on delivery of cargo to ISS (as is Orbital), as the companies have wrestled with everything from new rocket designs to delays in launch pad construction. This is a tough mission: Dragon has not flown as a maneuvering spacecraft, where it will exercise its navigation software, proximity operations sensors, thrusters, and solar power systems, all needed to reach the ISS. Most critically, the guidance and navigation software must perform flawlessly to enable formation flying within 30 feet of ISS; software checkout has caused months of delays, and in no case must Dragon endanger crew safety or the safety of ISS. If it can approach safely, my colleagues Don Pettit and Andre Kuipers will reach out with the ISS robot arm and grab Dragon. Berthing via the robot arm will follow, followed by leak checks, hatch opening, and cargo transfer. Most experts think Falcon 9 will launch successfully and put Dragon in orbit, but that Dragon may not achieve berthing with ISS. I rate the odds about 50/50 on an actual berthing with the Station. Success on the Dragon mission will make NASA’s commercial cargo strategy look like a good choice, with progress being made toward buying cargo services routinely. Success will also burnish the follow-on plan to send astronauts to ISS on commercial ships, around 2017. If Dragon launches on Falcon 9, but does not make it to ISS, SpaceX will claim that they at least accomplished the original first test flight objectives. They can then fly a second mission (as originally planned) to achieve rendezvous and berthing, after fixing any shortcomings. Of course, it’s the nature of the space business that a failure always helps pave the road to eventual success. NASA and SpaceX can claim that “we learned from the test” – and they will go ahead with the next test launch as soon as possible. But a failure will anger a Congress very skeptical of the commercial crew launch approach, even as it recognizes the need for commercial cargo services. If SpaceX suffers a spectacular failure, (and I’m rooting for success), you’ll see calls for NASA to reshape its plans for commercial astronaut launches. Congress the past couple of years has appropriated only half the funds requested by White House for commercial astronaut launches. A Dragon failure may cause legislators to reduce NASA’s private astronaut launch funding even further. Without those funds, NASA’s 2017 date for commercial astronaut launches will slip further. Congress instead may force NASA to choose a proven satellite booster (Delta IV or Atlas V) and one commercial space capsule to restore astronaut access to Earth orbit as soon as possible. Already, we are waiting far too long to restore our ability to get our people to the ISS. It will take much more than Dragon success to correct the fix we are in in terms of providing vital space access. We’ve lost three years as NASA’s commercial program has lagged. It will cost more, but I think NASA itself should quickly build a rocket/capsule system to restore our access to ISS. We are risking our $100 billion investment in the Space Station as we go year after year without a domestic rocket to get our crews up there, all the while paying the Russians $55M+ per seat (going to $63 million soon). When the commercial firms are ready, they should replace the NASA interim system. This dual-track approach costs more, but recognizes the risk to our Space Station operations posed by exclusive Russian access. Prudent leaders will increase the NASA budget to quickly restore our own launch capability. This might cost us 0.6% of the federal budget, rather than 0.5%. We can afford that investment. I don’t think we can afford the risk of not doing so. One measure of how hard this rendezvous and berthing job is comes from shuttle experience. We never failed to dock the shuttle at Mir or ISS, but it took humans at the controls to achieve that record. Mission Control can help, but in the end Dragon’s computers have to come close to human piloting skills, and that’s a lot to ask on a first attempt. Our mission aboard Endeavour with the Space Radar Lab 1 was nearly over. Yet Earth was ever-fascinating, as in this view from along Alaska’s coast. 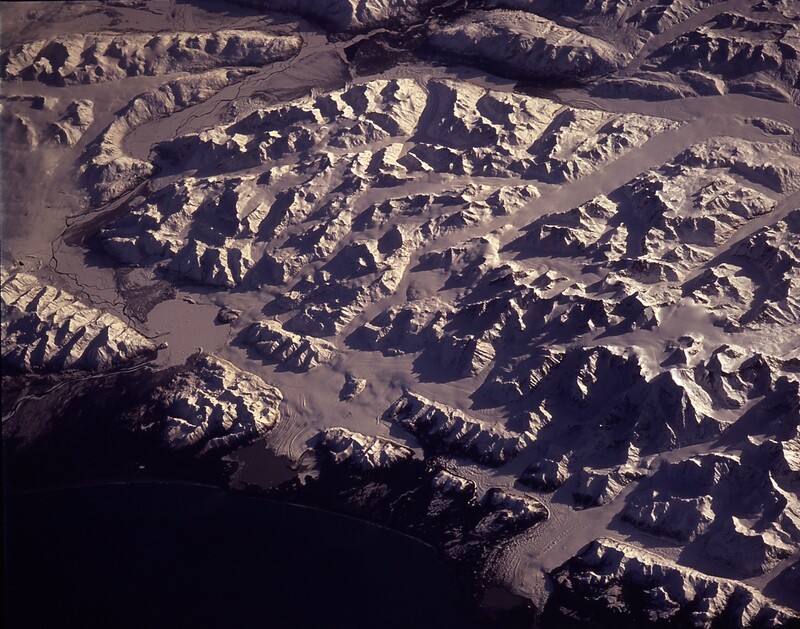 In this view, (with thanks to NASA’s Earth Observation office for the research), the spring thaw along the coast of the Gulf of Alaska has not touched the St. Elias Mountains, southeast of Yakutat Bay and Malaspina Glacier. A prominent glacier flows from Mt. Fairweather (15,300 feet) at right center, to form Cape Fairweather. Another glacier to the northwest almost reaches the sea; the valley of the Alsek River forms a broad, braided plain at upper left. In this 250mm Hasselblad telephoto shot, the low sun elevation and oblique angle provide a 3-dimensional appearance to the black-and-white landscape. I later cruised the inside passage of Alaska’s panhandle with my family, and these mountains and glaciers were a marvel. Our crew was blessed with 11 days of views like this, around the globe. I’m still trying to check off a few more with visits on the ground! From STS-59, Space Radar Lab 1, a panorama from 2 Hasselblad frames, STS-153-044/046. 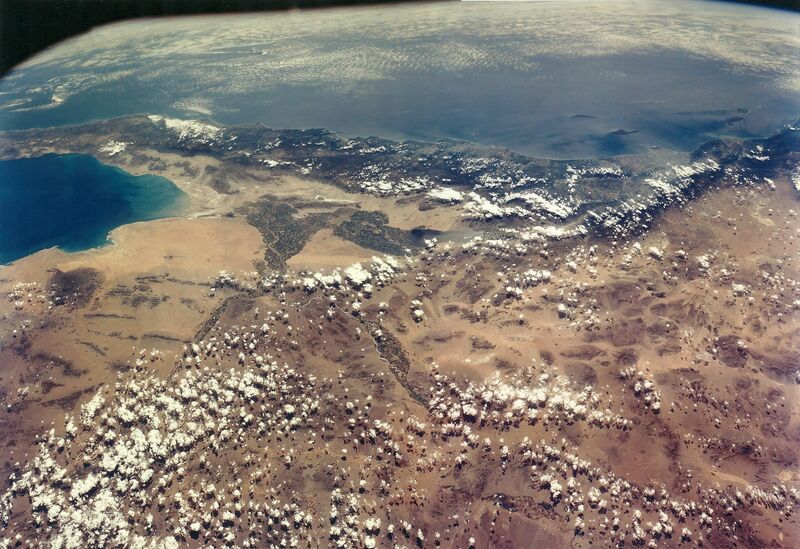 The scene is shot from over Arizona looking west at Baja, Mexico,the Gulf of California, San Diego, the Salton Sea, Los Angeles at upper right, Edwards AFB, and stretching toward the camera, the lower Colorado River. We were about 120 miles up in Endeavour when these images were taken. With views like these, it’s amazing the Endeavour crew (Apt, Chilton, Clifford, Godwin, Gutierrez, and Jones) got any work done inside the flight deck. Panorama by T. Jones.